The Oregon Ducks’ season is over, and there are a lot of reasons they didn’t win. Some bad shot selection, poor blocking out on the defensive glass, and a lack of strong screens to open up shooters. Before I get into that, I want to thank this team for giving us this ride. Nobody questions the heart of any of these guys. I certainly wouldn’t ever. They really had no business winning ten straight, including the conference tournament and two in the NCAA Tournament. 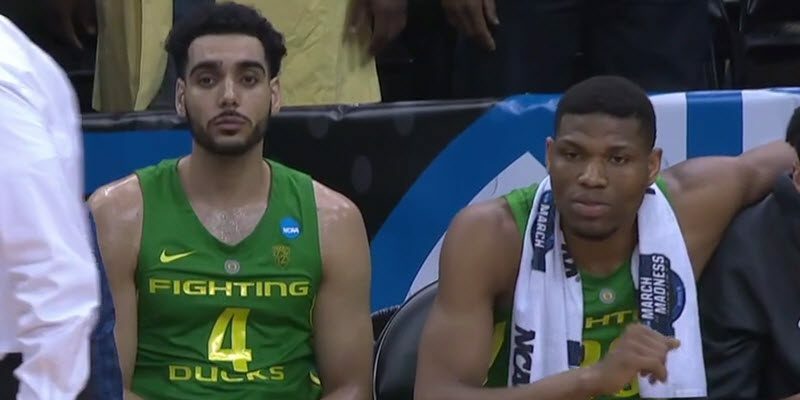 To Ehab Amin and Paul White: Once a Duck, always a Duck. Thank you. I also think Oregon maxed out their potential. They played a number one seed to a one possession game in the Sweet 16 on a court Virginia was really familiar with. Again, they played an elite ACC team to a one possession game on a neutral court over 2,000 miles from home. If Payton Pritchard had hit a couple more, Oregon hadn’t taken as many bad shots, or if they had come up with a few more rebounds on the defensive end, the Ducks would probably be moving on. But against a team like Virginia, you can’t afford any of those mistakes. I’m standing and applauding the Ducks. They were special this year. Oregon was tentative on offense and came out as usual, shooting way too many threes. Way too many. Oregon fell behind 7-3 and Virginia had multiple chances to stretch the lead and make Oregon chase for the entire first half. But the Duck defense held and shockingly, the Cavaliers took even worse shots at times. A turning point was, once again, when Amin entered the game. He grabbed a rebound, hit a driving layup with his left hand, and drained a couple threes where Pritchard drove and kicked it out to him. The Ducks were in business. And then they weren’t. They got slaughtered on the glass in the first half. They gave up 7 offensive rebounds in the first 17 minutes alone. White and Kenny Wooten were nearly invisible on the glass, and the guards sank back too closely to the basket, so when the ball deflected toward the free throw line they weren’t there to collect it. Oregon was out-rebounded 20-13 in the first half, and 7-0 on the offensive glass. They also committed some … un-smart fouls that forced them to play softer on defense than they might have. Louis King reached twice and had to sit early, and Paul White gave up a bad foul 25 ft. from the basket. Amin also took a terrible three point shot with ten seconds to go on the shot clock — 28 ft. out and he played hero ball. That shot, with Oregon up, changed the rest of the first half. Oregon needed to get good shots on every possession. Every possession. Not just the one’s that were easy to get. White also closed out terribly and really softly not once, not twice, but three times on Virginia’s shooters. When he rotated, he sort of jogged at the shooter with a faint hand up. He was never going to block the shot, but he’s 6′ 9″ with some length, and you want to put some worry in the shooter. I thought the analyst Mike Brey got it right. Virginia screened off the ball and opened up their offense. Meanwhile, Oregon allowed the Cavs’ big defenders to hedge so far out on Pritchard that Oregon couldn’t start the offense within 24 ft. of the basket. Then Oregon got impatient and took a few bad shots. Even 3-4 bad shots in a half is brutal against a team as good as Virginia. Oregon needed to swing the ball before the hedge got there and then attack from the wing. I thought that little run at the end of the half with Pritchard missing a really deep three and the Cavs scoring near the buzzer sent the Ducks to the locker room a little defeated. Again, they had a six point lead and took some bad shots. They paid the price for it. King gutted it out through a painful ankle injury and hit some big shots. Amin’s energy came into play again. First, it was good, but then he tried to take on 4 Cav defenders on the break by himself, took a bad three and didn’t hit a wide open White. Altman took him out to calm him down a bit. Defensively, the Ducks made the same mistakes on the glass and gave Virginia even more second chances. 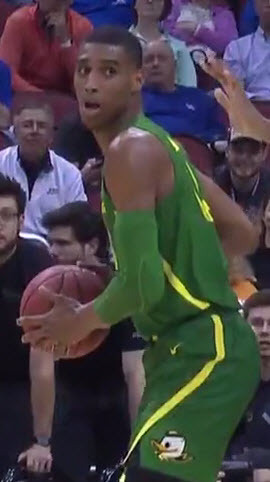 There were a lot of loose balls deflected into the paint that Oregon didn’t recover, and it came back to haunt them. On the upside, White got going, and Pritchard kept feeding him. White’s mid-range game is impressive. Very impressive. Then King hit a couple jump shots (really set shots given his ankle), and Oregon was in business. Ball movement, ball movement, ball movement. That’s what made all of that happen. A perfect display of how this team came together offensively happened in the second half. Francis Okoro sent a terrific skip pass to White, who passed into the corner to King, who made it 42-40 Oregon. Just a terrific set of passes. Spread it out or penetrate, make the defense chase and kick it to shooters hitting shots. I thought one turning point was when the game was tied at 45, and Oregon turned it over twice trying to drive into the lane. Yes, King may have been fouled when he turned it over, but he was a bit out of control. Then Will Richardson tried the same thing off a scramble play when he could’ve jump stopped and possibly gotten a decent shot off. King missed a layup and a three, and Pritchard nearly air-balled a three. Then King DID air ball a three. Oregon was done. Five straight misses on make-able shots, and then they gave up an offensive rebound to the Cavs. Oregon trapped next, and Wooten fell asleep at the back end. The Ducks battled to the end but at that point they were fighting the clock. Pritchard went 3-12 and 1-6 from three. A brutal shooting night for him. But Pritchard did enough other things to help Oregon win, with seven rebounds, six assists and a lot of good choices. To his credit, he drove to the basket and was blocked a few times. Still, he kept driving. The referees only called 27 total fouls in the game. In the Pac-12, Pritchard might’ve shot 20 free throws. The tournament is different. More on this later, but whether King decides to try to go to the NBA or not, he didn’t play like he was ready. He made one nice one-on-one play in the first half: a drive and leaner over the defender. However, that shot would get blocked at the next level. Louis King shooting a three versus Virginia. King’s a very good college player, but he may be NBDL bound if he goes to the draft. I said it last year with Troy Brown — unless things change for him in the next year, he’ll be playing more years overseas than in the NBA. King may leave, but with one more year of growth, he could be a legit lottery pick in 2020. With White’s career over, I’ll say a few things. He played through a tremendous amount of adversity this year. He gave everything he had. I was tough on his game because I think he had more to give, especially on the glass and on defense. But White’s heart is unquestioned. Virginia Coach Tony Bennett called Oregon’s defense “a tricky defense for sure,” and he’s right. The Ducks have an identity, and it’s defense. Cavalier Ty Jerome commented correctly that Oregon’s length, communication and switching is what caused them problems. Look for that again for the rest of the time you see Altman coaching. Oregon will add even more length next year with the recruits they have coming in. Now I’ll answer the question I hear from casual fans: “What if they’d had Bol Bol?” Well, we all saw it, and this is a Final Four-caliber team with him. No doubt. It doesn’t meant they’d have gotten there, but I would have liked their chances to win 27 games and be a very high seed. We’ll have more on the Duck women this next week along with recruiting for both teams, and maybe a little backstory or two as the Ducks finish a terrific season that wasn’t meant to be, and then was.